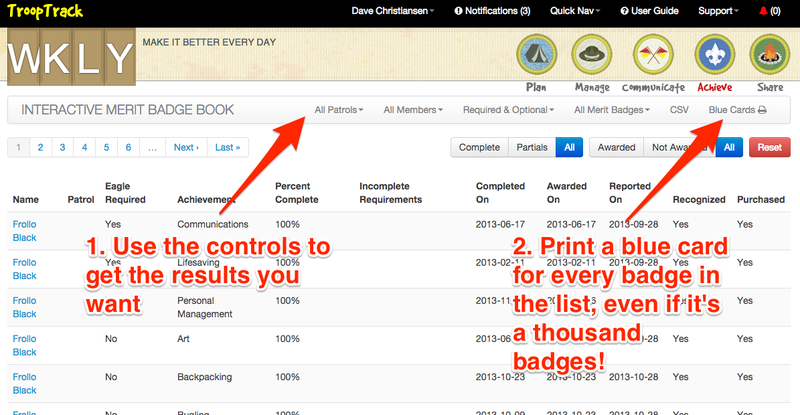 2) You'll be able to print blue cards based on the results of options chosen using the merit badge book. This includes the ability to print a blue card for every merit badge ever earned in your troop. This can take a few minutes, so the PDF is actually emailed to you when it's ready. 3) You'll be able to upload images of signed blue cards for a merit badge on the user profile. 4) Blue cards printed with the methods described in #1 & #2 will include the requirement #'s and completion dates on the back. 5) I add a few more places where I shamelessly promote our micro-perforated blue card paper. It makes using blue cards completely hand-cramp free! And here's a screenshot from the merit badge book.